The opening round of group games at the 2015 Africa Cup of Nations has delivered penalty misses, last-gasp winners, no goalless draws and some man-of-the-match presentations with a twist. The Confederation of African Football (Caf) has given fans the chance to hand out awards to the chosen star man in fixtures, but have they gone to the right players? Here, we put forward the round-one stars chosen by you, our reporters on the ground in Equatorial Guinea and African football's governing body. BBC Sport's Alex South from Ebebeyin and Malabo: DR Congo's Yannick Bolasie for me. He's come so far in such a short time and could be the one to take this tournament by storm. His clubs before Crystal Palace aren't the biggest names in football but his improvement from talented player to one of the first names on the team sheet is remarkable. He's a player the African fans love, every piece of skill rewarded with a huge cheer. BBC Sport's Matthew Kenyon from Mongomo: A couple of inspired moments from Mame Biram Diouf in Senegal's smash-and-grab win against Ghana. He might have been a bit lucky with his equaliser - but what about the bicycle kick which forced Ghana keeper Razak Braimah into a spectacular save? His attitude inspired the team. 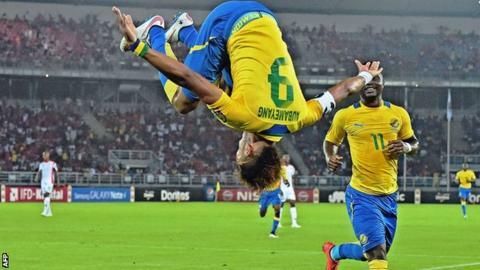 BBC Sport's Steve Crossman from Bata: Equatorial Guinea's Emilio Nsue was the coolest man in the Estadio de Bata when he scored the opening goal of the tournament. Only an incorrect offside call prevented him from scoring a brilliant second and he led the line remarkably well for a man who's been playing at right-back for Middlesbrough for most of this season. BBC Sport's Ed Harry from Malabo and Ebebeyin: Bolasie against Zambia was DR Congo's best player, the spark. He turned DR Congo down in 2013 when they approached him to make his international debut but knew it was an honour to be asked and wanted to play for the country of his parents' birth when the time was right. The time is right now. Tipz; Algeria's Brahimi has some magic feet, my best player so far. Mamadi Sirleaf: Yannick Bolasie has been unplayable. His pace and strength have been so exceptional. Koech Chepkole: Has to be Aubameyang; he was outstanding and that celebration was superb! Serious contender for African player of the year 2015. Nderitu Wachira: Senegal's Moussa Sow is brilliant.